Last Wednesday afternoon, cell phones started ringing throughout RLP. In hushed, urgent tones, reports began circulating among refugees and staff: Rwandese asylum seekers were being forcibly repatriated from Nakivale refugee settlement in Western Uganda. Interpreters were quickly reassigned from consultations and testimony taking, as RLP staff and volunteers scrambled to figure out what was going on in Uganda’s largest refugee settlement, located several hours from Kampala. Within hours, reports were confirmed: dozens of Rwandese asylum seekers (whose claims for refugee status had been rejected in a recent sitting of Uganda’s Refugee Eligibility Committee (REC)) were lured to basecamp with promises of food, and claims that their status rejection would be reconsidered. There, rejected asylum seekers were herded onto lorries by Ugandan soldiers. As reality began to set in and chaos erupted (people running in all directions), soldiers fired shots into the air, people were injured, and families separated. At least five lorries filled with asylum seekers left Nakivale settlement for the Ugandan-Rwandan border. [See RLP/IRRI joint press release]. As in Canada, Uganda’s Citizenship and Immigration Act provides for a review process for rejections of asylum seekers’ claims. The Act also provides for procedural safeguards for the deportation of those who have exhausted all avenues for appeal. These forcible removals thus violate Uganda’s own refugee law, not to mention the principle of non-refoulement in international law. The removals are also part of a troubling political landscape that Rwandese asylum seekers and refugees in Uganda are currently facing… On which more later! Published by kellymcmillan on July 22, 2010 at 9:22 am under Breaking news. 0 comments. Published by perriravon on July 15, 2010 at 10:44 pm under In the field. 0 comments. Refugee law and … witchcraft law? Witchcraft certainly wasn’t on the list. Yet, during interviews and information sessions held prior to and during a recent twelve-day field visit to Kyangwali Refugee Settlement in Western Uganda, witchcraft was one of the most pressing legal issues raised by authorities and refugees alike. 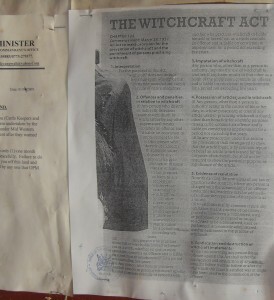 In fact, when our team of eight legal officers and counselors first arrived at the settlement to introduce ourselves to the Camp Commandant’s office, Uganda’s Witchcraft Act was prominently displayed in various locations, apparently to serve some kind of deterrent effect. Nonetheless, the practice of witchcraft, whether one believes in it or not, is widespread throughout Uganda’s refugee community and beyond. A number of my clients cited instances of witchcraft as the main threat to their security in Uganda. Child sacrifice for the purposes of witchcraft is an ongoing problem that has recently received a lot of media attention here in Kampala, after the kidnapping and beheading of three young boys. Correspondingly, the reality of witchcraft has slowly been incorporated into Uganda’s common law legal system. I am told that use of witchcraft is one basis for a provocation defense for murder in Uganda’s criminal law. The Witchcraft Act sets out penalties for those suspected of practicing witchcraft, or for being in possession of items used for witchcraft. Upon further investigation, our team in the field discovered that a number of the alleged instances of witchcraft in the settlement were actually cases of children dying from malaria, an extremely common and largely preventable and treatable illness. So once again, I am left wondering about the adequacy of a purely legal response to many of the realities refugees here are facing. The whole witchcraft thing is beyond me, but has definitely provided me with some interesting – and very unexpected! – food for thought. Published by kellymcmillan on July 5, 2010 at 2:58 pm under In the field. 2 comments. Last week, as part of a project I’m working on, I had the chance to talk with Nonoy Espina, the Vice-Chair of the National Union of Journalists of the Philippines. Mr. Espina is also a 20-year veteran of the Filipino press. We spoke about recent killings of reporters who have been critical of government officials, freedom of expression in the Philippines, and the prospects for change under the new President, who was inaugurated on Wednesday. As I mentioned in a previous post, politically-motivated killings of reporters and activists are all-too-common here in the Philippines; recently three reporters were killed in less than a week. I’ve decided to post a transcript of part of our conversation. I think it might be interesting to readers of this blog because it provides a personal perspective on what it’s like to work in a country where rights to life and freedom of expression are often violated. Since we talked for more than half an hour, I’ve edited our conversation for brevity, with Mr. Espina’s permission. What was your reaction to the recent killings? During a transition phase, you expect a lot of things. I think the message here with these killings is that the perpetrators really don’t care. It doesn’t matter who is in power, they’re confident enough that they will get away with it. It really shows the level of impunity of people in this country. They really feel that they can get away with anything. Why is there such impunity; why does it not matter who’s in power? The answer comes on different levels. On the first level, there is the political system we have, the system of government that’s gone on for so long. There’s a lot of political patronage, especially in the provinces, where you have people from a few elite families lording their wealth over others. Many of them are warlords and many of them were, and probably still are, crimelords. The national government has always operated on the basis of political expediency. It needs these people to deliver votes, and so it allies itself with these guys and that’s what allows the [politicians in] government to stay so strong, it’s what allows them to get away with a lot. The perfect example is Maguindanao – where you had one family lording their power over the province. That kind of system is everywhere; it subsists in a lot of provinces, but to varying degrees of course. It goes on at a lot of levels. Sometimes, it’s so bad that it runs all the way down to the village level […]. The problem is that the government has never really shown it cared. Just take the nine years of [Gloria] Arroyo’s Presidency. We’ve got something like 103 journalists dead and something like nine convictions, all of gunmen, none of masterminds. And I think that ties in to the political side of things. I’d bet anything that if you dig into these cases, a lot of these names are going to show up – mayor so-and-so, governor so-and-so, and so on. The latest killing, they’re saying that it was the vice-mayor who was the mastermind. So tell me how all this affects your day-to-day work as a journalist. In the provinces, where I worked for more than two decades, politics can get really personal. Some politicians really believe that public office is a privilege, it’s like they act like feudal lords. So you know that if you cross them, it can have dire results. To what degree do journalists find themselves compromising on their work as a result of this? To be honest, a lot. Sometimes journalists are so poorly paid that there are cases where local radio stations say to politicians, ‘Mr. Congressman, can you take care of our local reporter working in your district?’ So the congressman actually pays the journalist’s wages. You can’t expect him to report anything bad about the congressman. So it sounds like there’s a financial factor weighing in here alongside the fear of getting killed if you cross these guys. Yes, that’s true. In fact in some places, it’s either you take the envelope or you take the bullet. That’s no choice at all. What about you and your reporting? Do you still try to challenge corrupt officials? Have you written stories where, after publication, you find yourself looking over your shoulder? Oh, yes I have. I’ve almost lost my life, in fact. How did you almost lose your life? Well, back in 1989, I was almost picked up by military intelligence. Not to blow my own horn, but in Negros, I was like the resident insurgency specialist. I reported on the insurgency a lot and the social conditions that caused the insurgency. And if you do that, you get on the order of battle list, you’re automatically labeled an ‘enemy of the state’ and stuff like that. So one time they tried to pick me up. I was lucky. My reaction to extreme danger is not freeze or run; everything sort of slows down. I remember the first thought that I had was that they were not going to take me alive. They were stupid enough to try to pick me up on my own street, so I just talked loud enough to attract attention. I just kept my voice up loudly so that people came into the street. They asked if I was okay and I said ‘yeah, I’m just talking to my friends here,’ but I got them to stick around, saying stuff like ‘just stay here; I want to talk to you later.’ That pretty much limited the soldiers’ options, so they left. And that’s when I just slumped to the ground, trembling. So how do you live life with these threats, knowing that you can be killed just for doing your job? You just do what you have to do, I guess. I’m not trying to sound brave or anything, but I guess I’ve always believed that someone has to tell these stories. It’s sad; a lot of the reporting on the troubles people are experiencing does not delve into why they are taking place. I don’t think government likes people thinking about that. I imagine that people are still thinking a lot about the troubles in Maguindanao and the November massacre, which you alluded to earlier. How did that affect you? To what extent did it make you reconsider your chosen line of work? I’ll be honest with you. I’ve been through a lot of stuff, but I’m still traumatized by Maguindanao. For about a month afterwards, I kept being bothered by thoughts of it. There was nothing I could do to stop them, they just kept recurring and recurring, but I’ve pretty much gotten over that. […] I remember when I went there [during the aftermath], everyday bodies were still turning up and I kept wondering – is this not ever going to stop? It was a bad scene. What can be done on the legal side of things to help stop killings like this from happening? Are there legislative initiatives that need to be taken or is it just a matter of enforcing the laws that are on the books? You know, there really are too many laws in this country. There have in fact been calls for a law to amend the penal code to make the murder of journalists a more serious crime than ordinary murder. But we don’t want that, actually. Because we don’t want to be treated like anyone special. We don’t actually consider ourselves better than any other poor guys being bumped off. A life is a life is a life. All we’re asking is that people enforce the law, and do their duty to protect people’s lives. You know, sometimes we get cynical about lip-service pronouncements, but there is something to be said for moral suasion. If our leaders were serious enough about this, probably all they would need to do is just give a clear, unequivocal order to get the killers and stop the killings. And we’ve been asking [President] Gloria [Arroyo] to do that for nine years. She’s never done it. So what’s your outlook? Are you hopeful for the future (now that a new president, Noynoy Aquino, is coming into power)? Well, I don’t know […]. It’s important that we not give him a honeymoon of justice; lives are at stake here. More than a hundred lives have been lost, and hundreds more are in danger. We look at this as a matter of state accountability. It isn’t just Gloria that needs to be made accountable. Noynoy should also be made accountable, for making sure that lives are protected and that justice is being served. Published by christophermaughan on July 2, 2010 at 3:48 am under In the field, Interviews. 0 comments.